Neil Oliver in the program A History of Ancient Britain (BBC 2) states that during the Mesolithic period 10,000 BC – 3,000 BC there would have only been around 5,000 Mesolithic hunter-gathers in Britain. A stark statement considering considerable evidence has been found of Mesolithic activity in and around the Langdon Hills area. 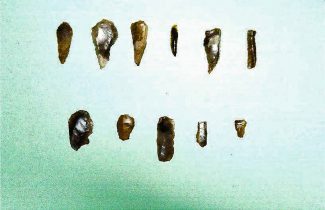 The Mesolithic period begins at the end of the last ice age when Britain was still a peninsula of mainland Europe and people could arrive on foot. As sea level rose around 8,000 BC – 6,500 BC Britain slowly became an Island leaving behind those that had come on foot; new immigrants would come by sea. Langdon Hills and its close proximity to the Thames and North Sea was an ideal place for them to hunt the animals available and gather the fruits of the land. Its height would have given them a sense of security as they could view the surrounding countryside through the trees. 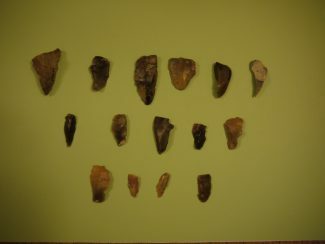 Most of the evidence for how people lived during this period lies in the stone tools left behind and Randal Bingley in his various articles in the publication Panorama produced by the Thurrock Local History Society list fifteen sites in and around Langdon Hills that have revealed these stones. One particular site he located in the Coombe Wood area he believes is at least 10,000 years old, this is prior to Britain becoming an island. This site he also believes was a possible hilltop hunter station where the hunters would visit for brief periods and bring their flints from some distance away for processing. The photographs are flints collected between 1924 and 1980 in a garden of a bungalow in Thames View, Langdon Hills, at the time occupied by Mr and Mrs Ruffler. They passed them and others onto Mr Apletree of the Langdon Hills Conservation Society. When this society folded they were passed onto Gordon Reid of the Basildon Natural History Society with whom they are still with today, waiting for a Basildon Museum to emerge. I am fascinated, as when I was a child we had our own museum, with things that we thought worthy of interest. In it we had a flint arrow head and a flint spearhead (bigger than a childs hand) In the 1950s my sister, Lily, became a teacher at Dunton School. 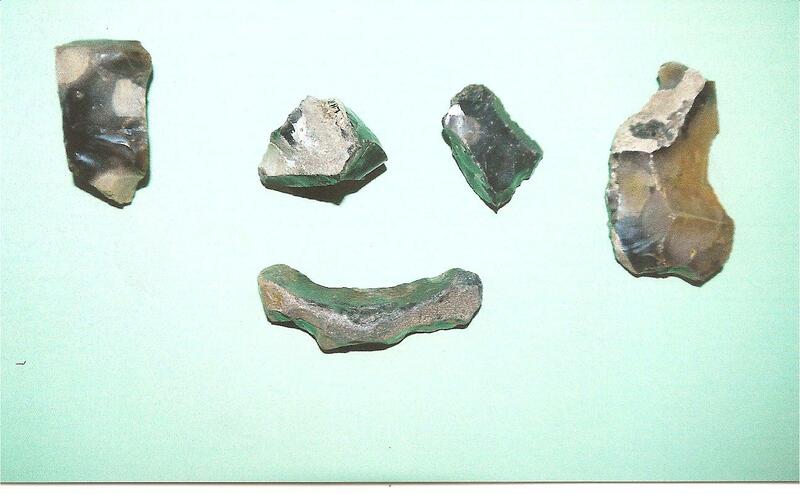 I think the family donated the flints to Dunton School, as the school had few resources. I wonder where they are now. A New Butterfly on Langdon Hills!